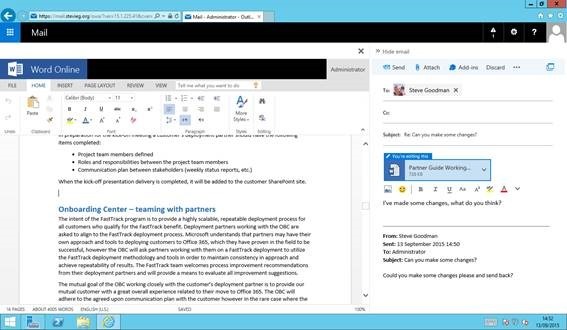 The new versions of Office and Exchange bring improvements that make it much easier for people to use email to work together on documents. In this tip we’ll look at how to use new features in Exchange Server 2016 and Outlook 2016 to work quicker and smarter. If you already use OneDrive for Business in Office 365 and plan on using Outlook 2016 with Exchange Server then you will gain additional capabilities when you upgrade. The Outlook user interface now has cloud integration to allow you to send a linked attachment rather than the attachment itself. 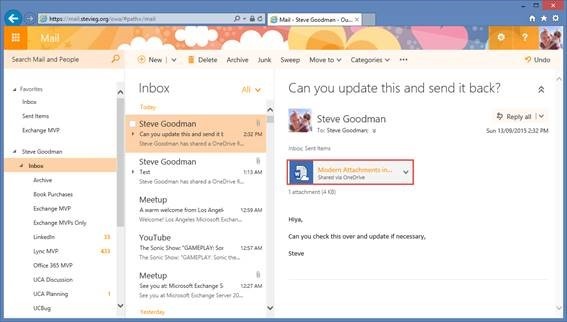 When adding a cloud-based attachment the sender has new options available. If the attachment should be sent as a new, separate file then the option is available to attach a copy but more important is the ability to either allow the recipient to view or edit. After the release of SharePoint 2016, this capability is likely to be extended to on-premises installations of OneDrive for Business bringing the new functionality to organisations who can’t store files in the cloud yet. Further improving the experience introduced in the previous version, Exchange Server 2016 uses the new Office Online Server for document viewing and editing. Office Online Server is the replacement for Office Web Apps Server and is updated in line with the 2016 line of products and the current Office 365 versions. The old Web Ready attachment viewing engine has been removed from Exchange 2016 therefore to view any attachments you must install Office Online Server alongside Exchange. Office Online Server can be installed as a farm for high availability but can’t be installed on the Exchange Server itself. The base pre-requisites include the Visual C++ Redistributable for Visual Studio 2015 and the .Net Framework 4.5.2 on Windows Server 2012 R2. Installation is straightforward and follows a simple wizard; however once installed Office Online server doesn’t perform any function straight away. Configuration must be performed on the Office Online Server farm, Exchange 2016. Additionally, you’ll need to install a valid SSL certificate on the Offline Online Server, add relevant DNS names internally and external, and publish it using your reverse proxy or load balancer. After installation, use the Set-OfficeWebAppsFarm command to allow document editing. To configure Exchange Server 2016 to use Office Online Server, we’ll need to configure the WacDiscoveryEndpoint at the server level and at the organizational level. If you want to make changes to the document and then attach the updated document in a replay, choose the Edit and Reply, as highlighted above. This will make a copy of the attachment and create it as an editable attachment to a new reply. You’ll be able to make changes to the document and then send it. The updated version will be stored in your mailbox. The new Office 2016 and Exchange 2016 suite provides better ways to manage attachments – whether in the cloud or accessed via OWA. You can use Outlook 2016 to link attachments to OneDrive for Business files and automatically share them – with integration into Exchange 2016 OWA, or use the new capabilities in Office Online Server and link it to Exchange 2016.